We have undisputed lines of succession among our lines, so the Vatican cannot deny the validity of our Apostolic Succession, although of course Rome does not recognize our church nor the many other churches that have broken off from them over the centuries. Some ancient churches including some listed below, were never even joined to the Roman Catholic Church in the first place. Rome broke away from the rest of ancient Christianity with “the Great Schism” when it declared itself “primo” by naming the Bishop of Rome “the Pope” and declared him the only Vicar of Christ. Many devout Christian Bishops also Catholic in the sense of “universal” at the time whose Apostolic lineages were older than Rome’s, such as Antioch, Jerusalem and Constantinople (the birthplace and cradle of Christianity) did not recognize the Bishop of Rome as the supreme head of Christianity. They never will. Those churches had their own lines of succession that didn’t go thru the Roman Popes at all. Below is a statement from the Vatican regarding their relationship to other Churches like ours that have Apostolic Succession. Sub Conditione consecration is a procedure in which two already consecrated bishops consecrate each other, thereby sharing their apostolic lines. In that way, each of their churches recognizes without question the apostolic succession of the other. This has been used, for example, to remove doubts about the validity of Anglican and Episcopalian successions by adding the universally recognized Old Catholic line. The Holy Orders and Apostolic Succession of the Old Catholic Church, Archiepiscopal See of Utrecht, have always been and still are recognized by Rome as “valid.” There is no question as to their validity. The Holy Orders of our church are derived directly from this source and carry the very same validity. We have carefully maintained and documented our Apostolic Succession. In 1655, Antonio Barberini, nephew of Urban VIII, was consecrated to the Episcopate under authority of the Bishop of Rome, by Bishops Scanarello, Bottini and Govotti. He was Archbishop of Remes 1657 until his death in 1671, and was made a Cardinal. It is from Bishop Barberini that the Roman lineage from Peter branches off from the Bishops of Rome. The Lost Book of Nostradamus was a bound collection of misc sayings and watercolor drawings. The illustrations were perhaps painted by Nostradamus’ son by his second wife, Caesare, while Caesare was still a child. Caesare became a skilled painter as an adult, so probably had artistic talent as a child. The bound manuscript of cryptic images and sayings was given to Cardinal Barberini, one of the pivotal bishops in our lineage. Narrator: The Last page of the manuscript states that it is given to a Cardinal Barberini in 1629 at his own request. The cardinal is the nephew of the Pope at that time, and is in charge of the Vatican Library. 255 Arnold Harris Mathew, Old Catholic Bishop for Great Britain, Archbishop of London, founder of “the Mathew Line”. 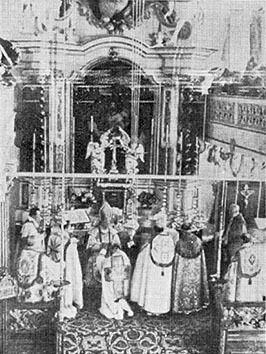 He was consecrated Regionary Old Catholic Bishop for Great Britain April 28, 1908, at St. Gertrude’s Church, Utrecht by Bishop Gerardus Gul, assisted by Bishop J. J. 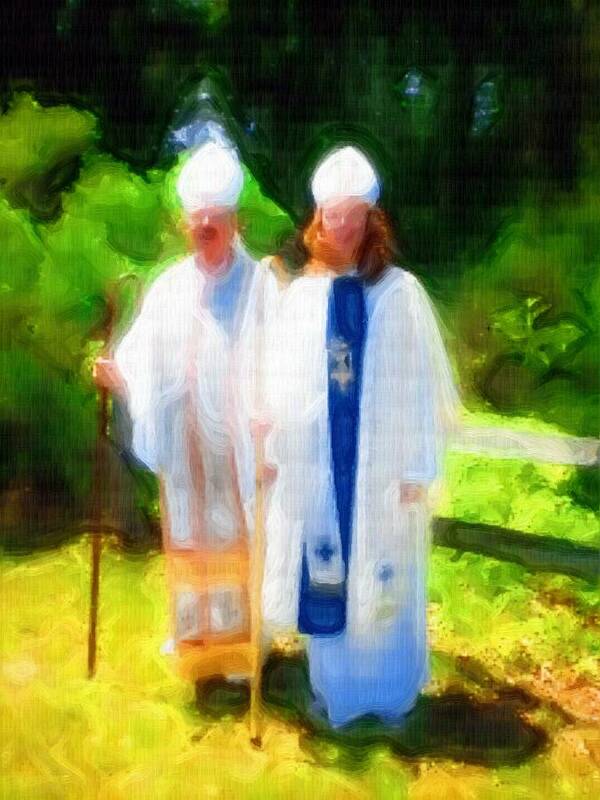 Van Thiel of Haarlem, Bishop N. B. P. Spit of Deventer and Bishop J. Demmel of Bonn, Germany. His consecration is pictured on the right. Mathew was elected Archbishop in 1911. Archbishop Eyre, at St. Andrew’s Roman Catholic Cathedral, had ordained him to the Priesthood Glasgow in 1877. He came from distinguished Irish parents. He was the great-grandson of Francis Mathew, First Earl of Landaff, of Thomastown Castle, Tipperary. He consecrated Prince Rudolphe Francois Eduard Hamilton de Landas-Berghes, also in our lines of succession, see below “A Different Line”. (Note: Archbishop Mathew’s archdiocese was in London, England and became autocephalous). Bishop Thomas SARGENT of the Community of Catholic Churches, A co-consecrator of Thomas James HICKEY in 1991, joined the Free Catholic Church as one of its bishops. Bishop Sargent brought a different line of Old Catholic succession, one which does not pass through the Liberal Catholic (Wedgwood) succession. In addition, his line includes the Protestant Episcopal succession. Both lines come through Bishop William Montgomery BROWN [Pictured Right]. Brown was originally consecrated in the Episcopal Church (1898) and was later consecrated sub conditione in the Old Catholic succession (1925) when he chose to transfer his allegiance. +Katia inserts: …while awaiting the verdict of his deposing as an Episcopal bishop for heretical teachings, among which was communism and Marxism! 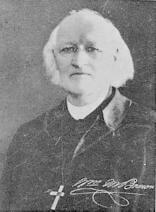 According to Bishop Brown’s obituary in 1937, he was “the first Bishop of his communion to be tried for heresy since the Reformation, and the first of any creed in America to be disposed for heretical teachings.” In his later years he became quite an eccentric, but not a heretic, said Time Magazine in their 1925 article entitled The Skinning of Bishop Brown. And here’s the Wikipedia article on Bishop Brown. Despite his supposedly heretical beliefs in later life, Brown was a duly consecrated Anglican/Episcopalian bishop and later an Old Catholic Bishop. These two lines entered our succession through Bishop Sargent and all those upon whom he laid hands. Prince Rudolphe Francois Edouard Hamilton, Grand Duke of Lorraine-Brabant, Prince de LANDAS-BERGHES et de Roche and Duke de St. Winnock, Archbishop of the Old Roman Catholic Church, on October 3,1916, consecrated William Henry Francis Brothers, who, with co-consecrator Henry Carmel Carfora on August 25, 1935 consecrated Albert Dunstan Bell. Albert Dunstan BELL was consecrated on August 25, 1935 and consecrated Edgar Ramon Verostek. Edgar Ramon VEROSTEK was consecrated on March 9, 1940 and with Kleefisch (see Russian Orthodox lines) consecrated Charles H. Hampton. Herman Adrian SPRUIT on June 22, 1957. 127 Paulose Mar Athanasius (Kadavil Kooran) was consecrated on December 4, 1907 by Mar Ignatius Peter III as Syrian Antioch Bishop of Kottayam and Metropolitan of Malabar (India). 128 Mar Julius I (Antonio Francis Xavier Alvares) was consecrated July 28, 1889, by Paulose Mar Athanasius, under authority of Patriarch Ignatius Peter III to be Archbishop of the Latin Rite Independent Catholic Church of Ceylon, Goa and India. 129 Joseph Rene Vilatte was consecrated on May 29, 1892 in Columba, Ceylon at Our Lady of Good Death Cathedral by Mar Julius I, under authority of a Bull of Mar Ignatius Peter III, to serve as Archbishop of North America. In 1944-45 a series of Codicils and Concordats led to the formation of the Federation of Independent Catholic and Orthodox Bishops. The first of these united the major lines of Archbishop Lowell Paul Wadle (American Catholic Church, +Rene Vilatte succession), Patriarch Anthony Aneed (Byzantine Catholic Church, Greek Melchite succession) and Bishop Edgar Ramon Verostek (Bishop Commissary for the American Old Roman Catholic Church). The Old Catholic lineage is derived from those Roman bishops who declined to approve the decree by the Roman pontiff declaring himself infallible (Council of Utrecht – 1870). In 1957 Herman Adrian Spruit [Pictured Right] was consecrated a bishop for the first Church Universal by Bishops Charles Hampton, Archbishop Lowell Paul Wadle and Bishop H. Francis Marshall. Upon the death of Archbishop Kleefisch, in 1955, his primacy was bequeathed to Archbishop-Patriarch Anthony Aneed. Archbishop Herman Spruit became the President of the Federation of Independent Catholic and Orthodox Bishops. On June 27, 1965 Archbishop Robert Raleigh (Boyle) and Archbishop Herman Spruit imposed hands on one other in a specific sub-conditione ceremony for the purpose of uniting their respective jurisdictions. Archbishop Robert Raleigh retired in 1965 shortly after naming Archbishop Herman A. Spruit his successor. Upon the death of Patriarch Anthony Aneed in 1970, the primacy of the Byzantine Orthodox Catholic Church also passed to Archbishop Herman A. Spruit. Within this jurisdiction were two major primacies: +Aneed’s which included the Greek Melchite lineage and +Kleefisch, which included the primacy of the Russian Orthodox Church. Since Patriarch Aneed was enthroned Patriarch in 1946 the title of Patriarch then passed to +Spruit by the last will and testament of +Anthony Aneed.